WILD rockers Guns Ν' Roses — hailed as the most dangerous band in the world — are set to rock Tyneside this summer. They will play Gateshead International Stadium. The date and ticket prices will be announced on Monday. The date is expected to be sometime between the Dire Straits concert on June 13 and the Bryan Adams show on July 12. The band's image, of booze and drug abuse, has led to many brushes with the law. Singer Axl Rose was jailed 20 times as a teenager, and Stoke-on-Trent born guitarist Slash is a former heroin addict. Their concerts are known as being among the world's most exciting. But at the 1988 Donington Festival two British fans were trampled to death in a crowd surge. The wild men of rock, Guns Ν’ Roses are heading North. They play in the region this summer — a gig which has created a fantastic response from fans who want to see their favourites in action. 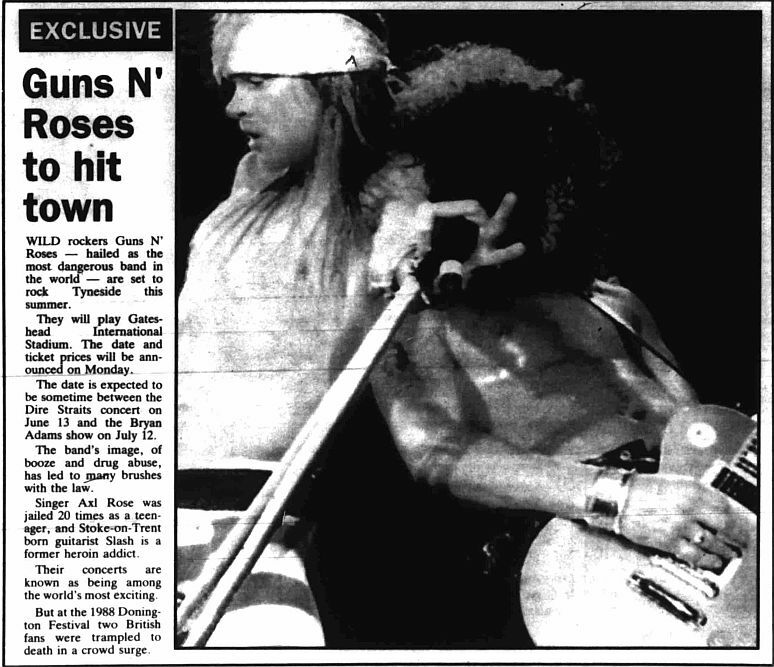 WHEN news of this summer's Guns Ν' Roses concert at Gateshead Stadium broke in The Journal last Friday, it spread like wild fire. The venue’s telephone lines were immediately jammed by fans from all over the North demanding tickets for the band who self-promote a menacing reputation. Guns Ν’ Roses wallow in the “honour” of being dubbed the wildest and most notorious rock band on earth — the Led Zeppelin of the 90s. Some may refute that but the band’s track record in the seven years they have been together, with UK classic hits Sweet Child O' Mine and Paradise City, and more recently Live And Let Die and You Could Be Mine, has earned them world-wide credit. But it is not just their unique rock style which will persuade fans to part with their brass and pack the 35,000-capacity venue on June 16. Guns Ν’ Roses are currently the most exciting live rock band, pushing themselves right to the edge with every performance. They are self confessed masochists, making no secret of booze binges and drug abuse — the archetypal Rock and Rollers. The heroin addiction of lead guitarist Slash and bass player Duff McKagan has apparently been tackled, with the band declaring they are trying to stay "clean” — no doubt realising after a three-year gap between their hugely successful debut album. Appetite For Destruction, and its followup, that their vices were putting their music at stake. Their wild men image and rock and roll antics have led to numerous run-ins with the law, some so close to the knuckle it looked as though they would be off the circuit for a short stretch behind bars. Lead singer Axl Rose was arrested and jailed 20 times as a teenager, and with Slash — real name Saul Hudson, born and raised in Stoke-on-Trent — at the forefront, the band has often seemed possessed of a self-destruct mechanism. Before 150,000 fans in Rio de Janeiro last year, the band walked off 20 minutes early because they did not feel the crowd was responding well enough to the music. At another concert lead singer Axl stopped singing half way through a number and refused to play on when he spotted a fan in the audience with a video camera. A riot broke out and the band had to make a swift escape. But the most shattering incident in the band's seven year history was the death of two of their fans at the annual British rock extravaganza at Donington, near Sheffield, in 1988. The 110,000-strong crowd surged forward when the band were playing, several people fell at the front and two were trampled to death. The incident really shook up the band and still burns in their memories today. GUNS N’ ROSES will play their hearts out when they land in the region as a special “thank you” from them to their loyal fans. The band specifically asked to play Newcastle, singling out the city from all the towns and cities nationwide. This fact was exclusively revealed to Platform in an interview with the band's promoter Paul Flowers this week. “Newcastle was the first time the band ever headlined a gig when they played the City Hall back in 1987 I think it was. 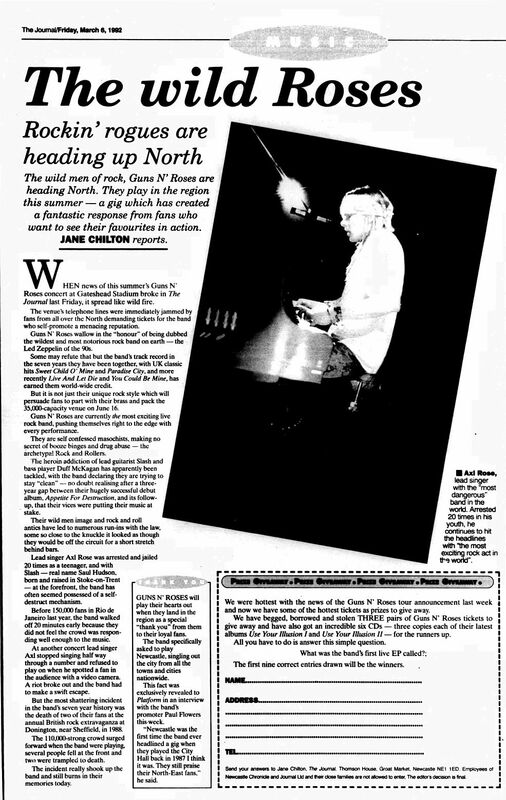 They still praise their North-East fans.” he said. GUNS ‘n’ ROSES – in the middle of a triumphant European tour – bring their sell-out show to Tyneside when they appear at the Gateshead International Stadium on Tuesday, June 16. They kicked off in Dublin and this week they had 76,000 fans in Hungary screaming for more of their fiery brand of pop and heavy rock. There may have been changes in their line-up recently but Guns ‘n’ Roses have emerged once again as one of the world’s top selling and most sought after bands. Geordies are guaranteed a night to remember in Gateshead with some tickets still on sale. 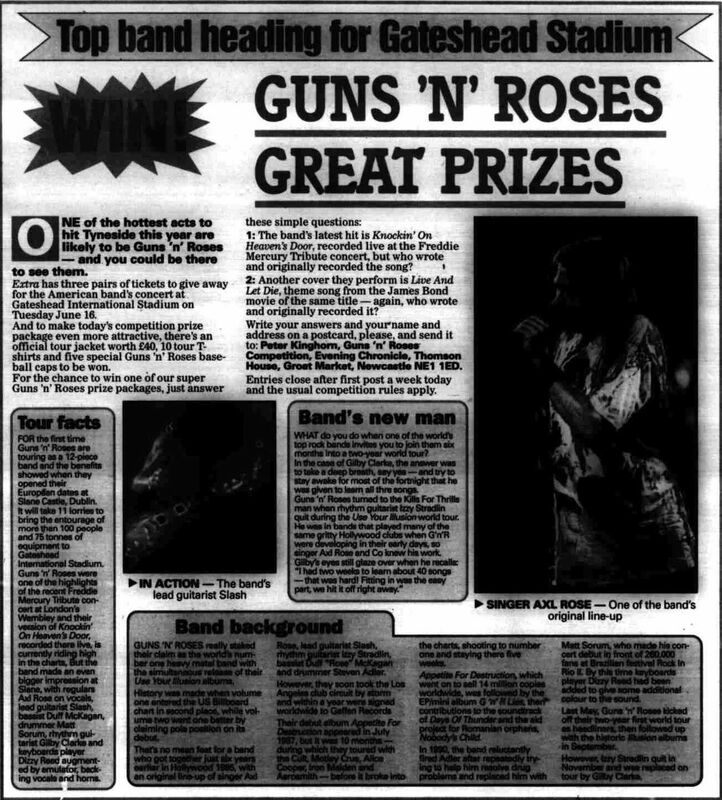 FOR the first time Guns ‘n’ Roses are touring as a 12-piece band and the benefits showed when they opened their European dates at Slane Castle, Dublin. It will take 11 lorries to bring the entourage of more than 100 people and 75 tonnes of equipment to Gateshead International Stadium. Guns ‘n’ Roses were one of the highlights of the recent Freddie Mercury Tribute concert at London’s Wembley and their version of Knockin’ On Heaven’s Door, recorded there live, is currently riding high in the charts. But the band made an even bigger impression at Slane, with regulars Axl Rose on vocals, lead guitarist Slash, bassist Duff McKagan, drummer Matt Sorum, rhythm guitarist Gilby Clarke and keyboards player Dizzy Reed augmented by emulator, backing vocals and horns. What do you do when one of the world’s top rock bands invites you to join them six months into a two-year world tour? In the case of Gilby Clarke, the answer was to take a deep breath, say yes – and try to stay awake for most of the fortnight that he was given to learn all the songs. Guns ‘n’ Roses turned to the Kills For Thrills man when rhythm guitarist Izzy Stradlin quit during the Use Your Illusion world tour. He was in bands that played many of the same gritty Hollywood clubs when G’n’R were developing in their early days, so singer Axl Rose and Co knew his work. 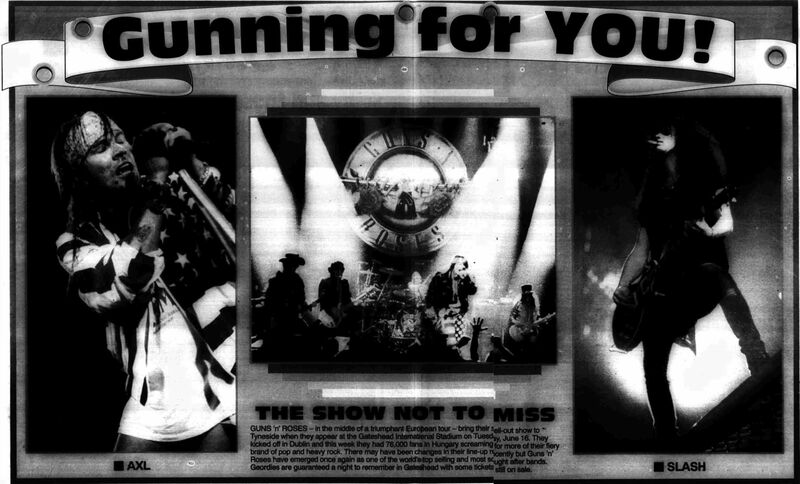 GUNS ‘N’ ROSES really stoked their claim as the world’s number one heavy metal band with the simultaneous release of their Use Your Illusion albums. History was made when volume one entered the US Billboard chart in second place, while volume two went one better by claiming pole position on its debut. That’s no mean feat for a band who got together just six years earlier in Hollywood 1985, with an original line-up of singer Axl Rose, lead guitarist Slash, rhythm guitarist Izzy Stradlin, bassist Duff “Rose” McKagan and drummer Steven Adler. However, they soon took the Los Angeles club circuit by storm and within a year were signed worldwide to Geffen Records. Their debut album Appetite For Destruction appeared in July 1987, but it was 10 months – during which they toured with the Cult, Motley Crue, Alice Cooper, Iron Maiden and Aerosmith – before it broke into the charts, shooting to number one and staying there five weeks. Appetite For Destruction, which went on to sell 14 million copies worldwide, was followed by the EP/mini album G’n’r Lies, then contributions to the soundtrack of Days Of Thunder and the aid project for Romanian orphans, Noobody’s Child. In 1990, the band reluctantly fired Adler after repeatedly trying to help him resolve drug problems and replaced him with Matt Sorum, who made his concert debut in front of 260,000 fans at Brazilian festival Rock in Rio II. By this time keyboards player Dizzy Reed had been added to give some additional colour to the sound. Last May, Guns ‘n’ Roses kicked off their two-year first world tour as headliners, then followed up with the historic Illusion albums in September. However, Izzy Stradlin quit in November and was replaced on tour by Gilby Clarke. More previews/pre-show reports from The Journal. A SELL-OUT concert by top rock band Guns ’n Roses was scrapped at the last minute yester day after singer Axl Rose collapsed with exhaustion. The star, known for his powerhouse performances, has been ordered to rest for 36 hours by his doctors. A band spokesman said: “It is complete physical exhaustion and the show had to be postponed on doctor's orders. The Manchester show will be re-scheduled and tickets should be retained. The Gateshead Stadium gig next Tuesday is not affected nor is the one at Wembley Stadium on Saturday. A spokesman for the band assured The Journal: "There is no threat whatsoever to the Gateshead concert on Tuesday. The band are really looking forward to it and it will definitely go ahead." Axl, 30, is currently taking it easy on doctor's orders at his Paris hotel, and is not expected to fly to Britain until Friday. A WEB of tangled steel towers above Gateshead International Stadium – setting the stage for two of the summer’s hottest rock concerts. The finishing touches are put on the 100-foot wide platform, where Dire Strait and Guns ‘n Roses will play to their fans. The flanking towers – 60ft high and like rocket launchers glinting in the sun – will house banks of speakers to blast out the sound. An international team of 50 have been building the massive stage since Tuesday, carefully bolting 240 tonnes of steel tube in place. Belgian firm Stageco has built the structure to suit the needs of both rock groups, because the two concerts are so close together. The stage is normal size for Guns ‘n Roses, but bigger than usual for Dire Straits. The different moods of music played by the two groups will be captured by a dual lighting system which will be switched over between concerts. IT WAS just 10 years ago this summer that the Rolling Stones played the first stadium concert ever staged in the North-East. From that moment on a regular trickle of major bands have stopped off on Tyneside during the summer months on the UK legs of their European and world tours. The list runs like a who’s who of pop's greatest — Tina Turner, David Bowie, Queen, Bob Dylan, Bruce Springsteen, Rod Stewart and this year's stats including Simply Red and Bryan Adams. It* almost taken for granted now that every summer some big name will be starring in the region. But, as Paul Flower, marketing manager for MCP. one of Britain's biggest band promoters, exclusively told The Journal, it's a massive operation taking more than a year of careful planning. MCP has been the driving force behind the Simply Red and Guns n’ Roses tour, booking them into Gateshead Stadium. And with the Guns n’ Roses show at Gateshead alone costing in excess of £300,000, there's a lot of money at stake. So is it just a simple case of securing a band, fixing a date and selling the tickets? Promoting can be a cut-throat business, with other rival promoters putting in higher bids to book the bands. The date of the show is fixed around the band and what geographically can work. Once a rough tour schedule is agreed, the hunt for a suitable venue is on. “For Guns Ν' Roses and Simply Red we decided on Gateshead because quite simply it offered the best all-round facilities," Paul explained. 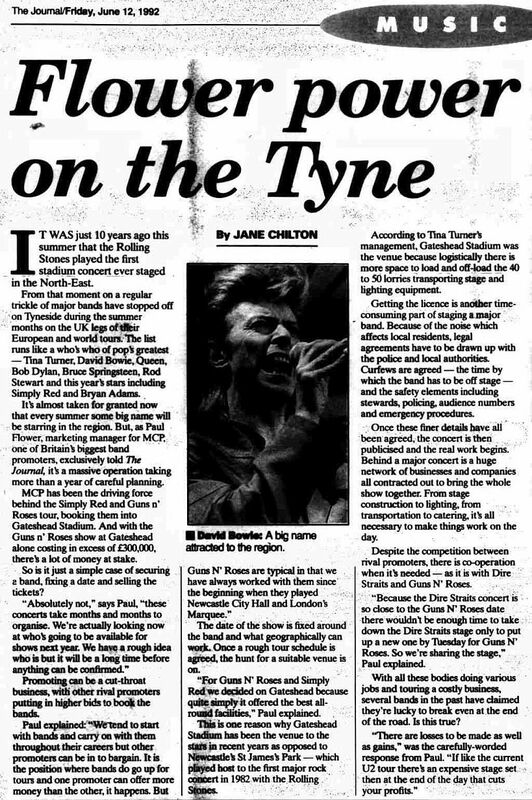 This is one reason why Gateshead Stadium has been the venue to the stars in recent years as opposed to Newcastle's St James's Park — which played host to the first major rock concert in 1982 with the Rolling Stones. 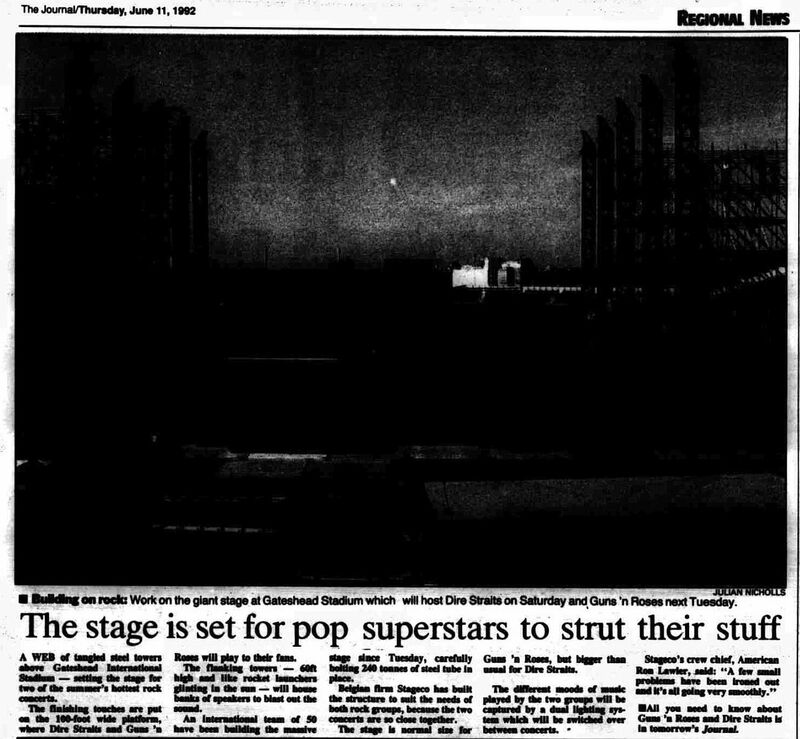 According to Tina Turner's management, Gateshead Stadium was the venue because logistically there is more space to load and off-load the 40 to 50 lorries transporting stage and lighting equipment. Getting the licence is another time-consuming part of staging a major band. Because of the noise which affects local residents, legal agreements have to be drawn up with the police and local authorities. Curfews are agreed — the time by which the band has to be off stage — and the safety elements including stewards, policing, audience numbers and emergency procedures. Once these finer details have all been agreed, the concert is then publicised and the real work begins. Behind a major concert is a huge network of businesses and companies all contracted out to bring the whole show together. From stage construction to lighting, from transportation to catering, it's all necessary to make things work on the day. Despite the competition between rival promoters, there is co-operation when it's needed — as it is with Dire Straits and Guns Ν' Roses. "Because the Dire Straits concert is so close to the Guns Ν' Roses date there wouldn't be enough time to take down the Dire Straits stage only to put up a new one by Tuesday for Guns Ν’ Roses. So we're sharing the stage," Paul explained. With all these bodies doing various jobs and touring a costly business, several bands in the past have claimed they’re lucky to break even at the end of the road. Is this true? There are losses to be made as well as gains," was the carefully-worded response from Paul. “If like the current U2 tour there's an expensive stage set then at the end of the day that cuts your profits." AMERICAN rockers Guns Ν' Roses roll into town tonight for the biggest heavy metal show ever staged in the region. And if the Dire Straits concert at the weekend is anything to go by the spectacle should go just as smoothly. Local	residents, the police, Tyne Wear Metro officials and Gateshead Stadium officials were all delighted with the way the crowd behaved on Saturday when Mark Knopfler returned to his roots with his supergroup and rocked the stadium for two and a half hours. With only a handful of complaints from local residents about noise on Saturday night, a Northumbria Police spokeswoman said: “The complaints were exceptionally minimal and it all went very well indeed. “I’m sure the same thing will happen when Guns Ν’ Roses play. "There were no reported crowd problems and as far as traffic congestion is concerned the 34.000-strong crowd were dispersed safely." Eight extra Metro trains were on standby at Pelaw to ferry the crowd away from the stadium at the end of the show. The same transport arrangements will be in force for Guns N' Roses today and Bryan Adams and Simply Red next month. In addition, to cut down on noise nuisance to local residents. Guns Ν' Roses will start earlier than normal so they finish around 10pm. Drivers are advised to park away from the stadium and walk or take the Metro. Parking is available at the stadium bowl, price £3 per car, providing 1,200 spaces. Around 26,000 fans are expected to turn out — 9.000 less than capacity. Tickets are still on sale at the stadium box office, price £21 and £23, until 5pm. A ROCK concert at Gateshead International Stadiu sent temperatures soaring and turned the air blue. Fans wilted in the heat as the crowd surged to see its Guns ‘n’ Roses heroes – and others got hot under the collar at bad language from lead singer Axl Rose on stage. The star band shared the swearing honours with support act Faith No More. “It did not perturb us. As police officers, we hear worse every Friday night,” added Mr Daines. St John Ambulance treated about 180 people, most suffering from dehydration of fainting fits. The most serious casualty was a 15-year-old girl who went to hospital with a suspected broken leg. Mr Daines said: “There were quite a lot of people helped over the barrier, escorted away and given first-aid. There were half a dozen arrests for public order offences from the crowd of 25,000. “That’s a very small number for a long day with that many young people,” he added. About six cars, parked in a nearby street, were broken into. IT all boded pretty well; a set kicked off with two tight tracks from their huge album Appetite for Destruction, full of rock bluster and punk attitude. But, somewhere along the next two and a half hours, Axl and Co began to lose their way. The more they turned to their rock and blues roots, the less convincing they became. And surely there should be some statute laid down against drum solos at any concert. To follow it with a stretch of Slash solo guitar was taking indulgence a bit far. That said, they do have guaranteed crowd pleasers up their sleeve. Just as things got a bit groggy, including a version of the Stones’ Wild Horses that made you wish Mick Jagger was up there instead, they hit back with Welcome To The Jungle – satisfaction guaranteed. Add to that the singalong hit Knockin’ On Heaven’s Door and the closer Paradise City, and the crowd seemed satisfied. But there remained a certain spark missing. 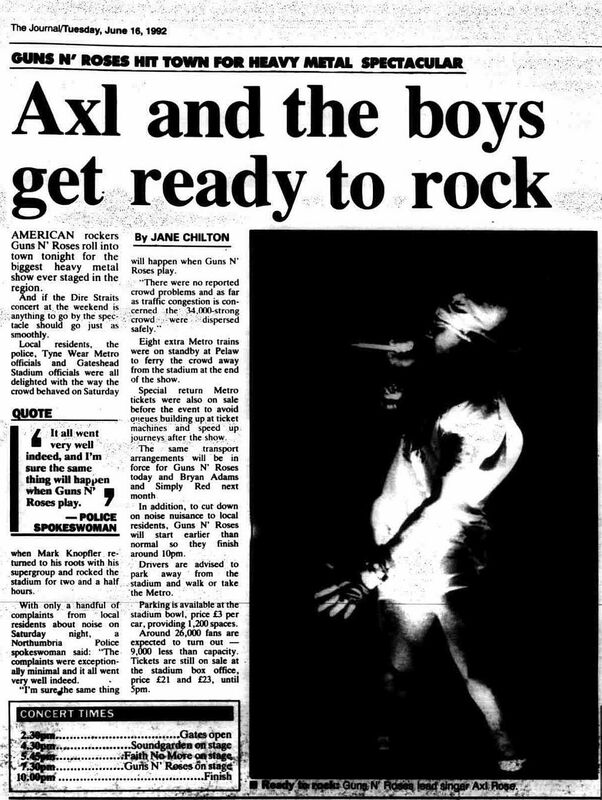 Axl constantly disappeared offstage for a leisurely change of shorts and jacket. When he’s gone, the stage can look pretty bare without him. Residents nearby may not agree, but the band could have also been louder, the only drawback in an otherwise bizarre but excellent support set by Faith No More. ROCK wildman Axl Rose’s fans are putting their hero in the picture ... by having his face tattooed on their bodies! Following the Guns N’ Roses sell out concert at Gateshead scores of his fans are being tattooed. 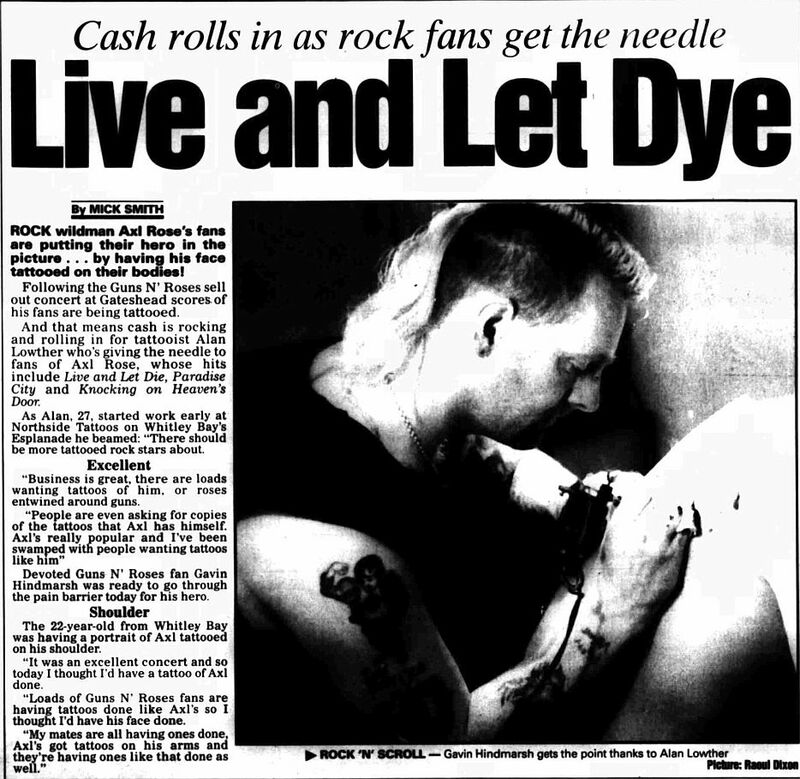 And that means cash is rocking and rolling in for tattooist Alan Lowther who's giving the needle to fans of Axl Rose, whose hits include Live and Let Die, Paradise City and Knocking on Heaven’s Door. As Alan, 27, started work early at Northside Tattoos on Whitley Bay's Esplanade he beamed: "There should be more tattooed rock stars about. “Business is great, there are loads wanting tattoos of him, or roses entwined around guns. Devoted Guns Ν' Roses fan Gavin Hindmarsh was ready to go through the pain barrier today for his hero. The 22-year-old from Whitley Bay was having a portrait of Axl tattooed on his shoulder. “It was an excellent concert and so today I thought I'd have a tattoo of Axl done. “Loads of Guns Ν’ Roses fans are having tattoos done like Axl’s so I thought I’d have his face done. “My mates are all having ones done, Axl’s got tattoos on his arms and they’re having ones like that done as well.